Dark Chocolate. Caramel. Oreo. Tart. That's a mouthful to say, but oh my gosh it tastes so SO good. 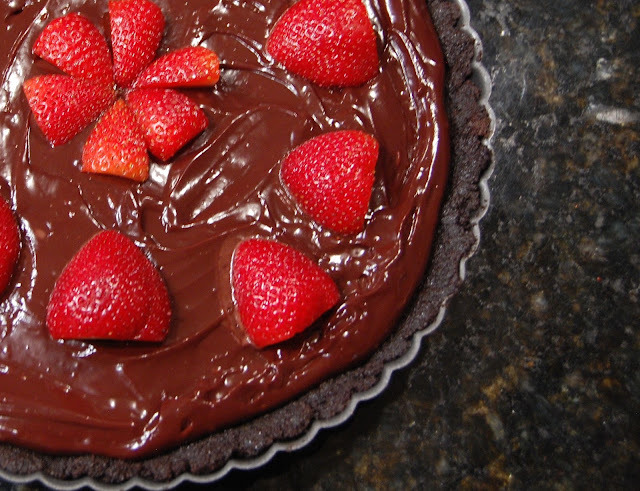 I made this tart a few months ago because my father-in-law saw something similar to it on a youtube channel and asked if I would make it for him at out next dinner we had together. 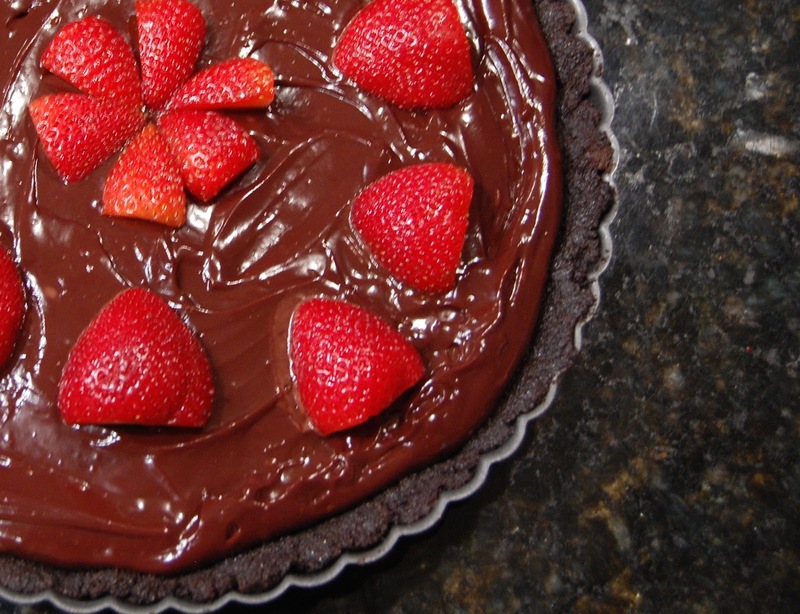 The one he had been craving was simply Oreos with chocolate ganache, but I figured I would add the extra component of salted caramel (which you all know I love) and strawberries to contribute to the sweet + salty combination. Needless to say, this is one of the only desserts that I've made that didn't produce any leftovers. 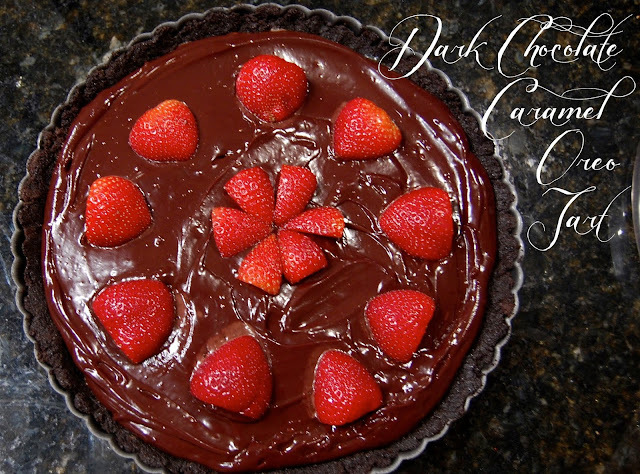 So, for this rainy Friday in Charlotte, I give to you the indulgent, delicious, can't-get-enough-of dark chocolate Oreo caramel tart that I wish I had a piece of right now for breakfast. Start with a package of Oreos put into a blender. immediately makes me happy. So pulse until it becomes crumbly & enjoy the smells. Take a stick of butter (8 TBS) and melt it. Combine it with the Oreo crumbs & mix. and stick it in the freezer to set. burn the sugar or the butter. Put it on medium heat and whisk slowly until the mixture begins to bubble. back in the freezer for 30 minutes. Heat 1 cup of heavy cream to a simmer over medium heat. Take about 12 oz of dark chocolate chips and put it in a glass bowl. When the cream is heated, pour slowly over the chocolate chips. Stir slowly, and it turns into ganache! Beautiful, yummy, silky, ganache. Let cool, and then add that last layer to the tart. See how shiny it is?! Love it. Put into the freezer for 30 more minutes. Right before you leave, add some sea salt and some strawberries. Then be obsessed. Like me and everyone else that tried it.